players - please ask for price. The Geronimo Hot Vintage has the typical sound of 50s to 60s pickups. It corrects all the flaw of early pickups as lack of attack, response at some frequencies and overall that annoying and persistant hum.. All those flaws are corrected with KC-GERONIMO® HOT VINTAGE pickups. KC-GERONIMO® HOT VINTAGE pickups expresses beyond whatever you can expect on amp brands such as Fender, Hiwatt, Carvin, Traynor, Marshall, Mesa Boogie, Peavey, and more more confidential brands. Meanwhile, if you use VOX tube amps, and if your main play style is not Blues or overdriven tones, rather choose the GERONIMO VINTAGE CLASSIC SPECIAL VOX® to access to the typical SHADOWS sound and other clean sounds of that period with non-overdriven clean tones. - Gold or black logo on vintage mint or white covers. Due to the extreme overdrive sensitivity of VOX tube Amps such as Vox AC-15 or AC-30, prefer this version that is equipped with genuine Alni3 magnets as were the original pickups of this era, to keep the clean sound you can hear on Shadows hits. The sound is clear, rich, with a smooth attack. Beware : We remind once again here that the magnet is ALNI3, as many believe there were AlNiCo3, that never existed. AlNi3 contains no Cobalt but copper in its place. Many uncultured or crooked pickup sellers will try to sell you pickups as using AlNiCo3 magnets, so beware, they are cheating you or simply do not even know their own job ..
- AlNi3 magnets made in USA. These pickup are intermediary between Hot Vintage and Special Vox. More punchy than Special Vox and less powerful than Hot Vintage, although more forceful than this one, but keeps the 50s-60s grain and can be used for any style of music. Sound is rich with a fine frequency response. It will be fine for playing Shadows and other musics of this era although it bears pretty well disorsion and overdrives effects. - Ceramic magnets made in USA. 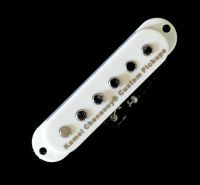 Please ask for white or vintage pickup covers. Also ask for reverse or standard polarity of the central pickup. Please notice that the Shadows initially played with normal polarity pickups. Reverse polarity were brought by Fender® only in the 70s. If the reverse polarity widely reduces hum, it also lowers the power of the intermediate positions but produces an interesting typical sound. If the middle pickup is averagely polarized, there will be no power loss, but the vintage hum will be present. If your stratocaster® uses a 3 position selector, then there will be no need to choose between the two polarities as they have no influence in that case. Price is for a full set of 3 pickups. Ask for L/H sets prices.